Valentine’s Day is a day to connect with the people you love and enjoy some delicious meals. You don’t have to go out to a fancy restaurant or break the budget to celebrate this day. Taking the time to cook for one another is a romantic and great way to show your loved one that you care. 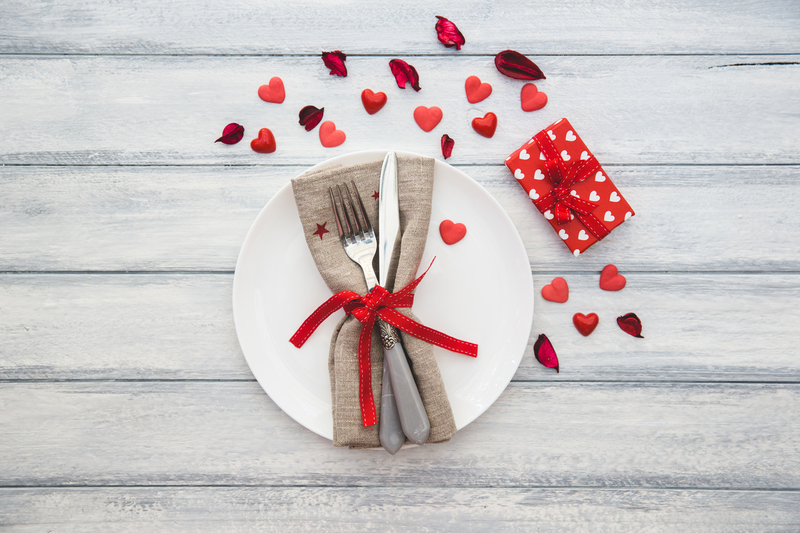 Enjoy these Valentine’s Day ideas for couples who still want to have a romantic meal without feeling like they have to leave the home to get it. Here are some great tips and recipes that are healthy and fun to make at home. In a mixing bowl, combine all ingredients except the pasta. Stir well. Cook pasta in boiling water for 4 minutes. Drain in pasta and add it to the mixing bowl of ingredients. Stir to combine. Place in a shallow 9 x 9 baking dish. Bake for 7 to 10 minutes. Nothing says romantic and cozy like pasta! This pasta is sure to warm your heart but is also heart-healthy with lots of vegetables. Health Happy tip: Use whole wheat penne noodles for extra fibre! Toss the potatoes and chopped carrots with black pepper and 2 tablespoons of olive oil on a large baking sheet. Roast the potatoes for 25 minutes, and then remove the baking sheet from the oven. Flip the potatoes and carrots, return to the oven and continue to roast until the potatoes are golden brown and tender when pierced with a knife, about 5 minutes more. Season the pickerel with black pepper. Mix together the thyme, parsley, basil, garlic and the remaining tablespoon of olive oil in a medium bowl. Spread the herb mixture over the pickerel fillets and place the pickerel in a small baking dish. Roast until the fish is flaky and almost cooked through, about 10 minutes. Remove the dish from the oven, cover with aluminum foil and set aside to rest for 10 minutes. TIP: if using frozen fish, be sure to defrost in the fridge the night before. To serve, place a pickerel fillet on each plate and drizzle with lemon juice. Divide the potatoes and carrots between the two plates and serve. Fish is high in protein, healthy fats and is easy to cook! This recipe can use any type of fish you have such as white fish, cod or salmon. Wow your loved ones with a healthy fish dinner. Heat the oil in large pot over moderate heat. Add the onion, bell pepper and carrots, cover and cook, stirring occasionally until the vegetables are soft, about 10 minutes. Add the cumin and cook, stirring, for 1 minute. Add the ground beef; increase the heat to high and cook, breaking up the meat with a spoon, until the meat is no longer pink. Stir in the tomatoes, water, salsa, oregano. Simmer, partially covered, stirring from time to time, for 30 minutes. Stir in the beans and cook, partially covered, 20 minutes longer. Serve and enjoy! Beans are hearty, healthy and full of fibre and protein. This chili is a great way to warm up on a cold day and an easy dish to make for your Valentine! These recipes are great to make with your Valentine. This Valentine’s Day, give the gift of cooking and enjoy eating a meal together! I hope you and your loved ones have a Health Happy Valentine’s day!